My name is Tom Richards, and I am a naturalist and aspiring wildlife filmmaker. As far as I can remember I have always had a fascination with the natural world, but it was really when my mother bought me My Family and Other Animals by Gerald Durrell that my passion for wildlife really began. The way he looked at the natural world and saw the character in each creature he encountered had me enthralled, and from then on I was addicted. In the modern age of connected media viewers use a multitude of formats to catch up with their favourite TV show or watch the latest film. However, be it through a smart phone, tablet or even a 3D home television, moving pictures are still a big part of people’s lives, particularly young people. I think it’s important to use this influential method of communication to educate as well as entertain, and instil in young people a sense of responsibility for the world we live in. Gerald Durrell once said “until we consider animal life to be worthy of the consideration and reverence we bestow upon old books and pictures and historic monuments, there will always be the animal refugee living a precarious life on the edge of extermination, dependent for existence on the charity of a few human beings.” I am inclined to agree – one only needs to take a brief look at the latest news about the environment to see that unfortunately, the modern era is not a golden one for the flora and fauna of the world. In 2011 I travelled to Nigeria to volunteer at the Afi Mountain Drill Ranch in Nigeria, a wildlife sanctuary for endangered Nigeria-Cameroon chimpanzees and drill monkeys. Between building fences for a new enclosure I tried to make a film about the magical place where I was working, and the struggle that is conservation in developing countries (over 90% of Nigeria’s rainforest is said to have been destroyed). Young, inexeperienced, and ill-equipped, I was unable to make a good film at the time, but I was moved by the work of the sanctuary in the face of a fast growing logging industry and the increasing numbers of farmers burning the rainforest inside the reserve where the Ranch lies. Since my visit to Afi I have been working on developing the skills that I need to be able to do justice to such a story. For me, natural history filmmaking is a way to show people the beauty of the world we live in and why conservation is so important. By using jaw-dropping sequences displaying fascinating examples of animal behaviour, blue-chip series like Planet Earth and Life Story have the power to seize a viewer’s attention, and I’m glad to see a shift (albeit slower than I’d like) towards directly discussing issues such as climate change, poaching and habitat loss. Feature length documentary films like The Cove and Virunga demonstrate what it’s like on the front line of conservation, and series like Gorongosa: Rebirth of Paradise and I Bought A Rainforest show viewers the emotional challenges in the fragile relationship between animals and humans. All of these stories are important, and I want nothing more than to be a part of their being told. After graduating from the University of Exeter in 2012 with a degree in Animal Behaviour I spent some time travelling in Asia, studying Kung Fu and doing a bit of conservation work with giant pandas. 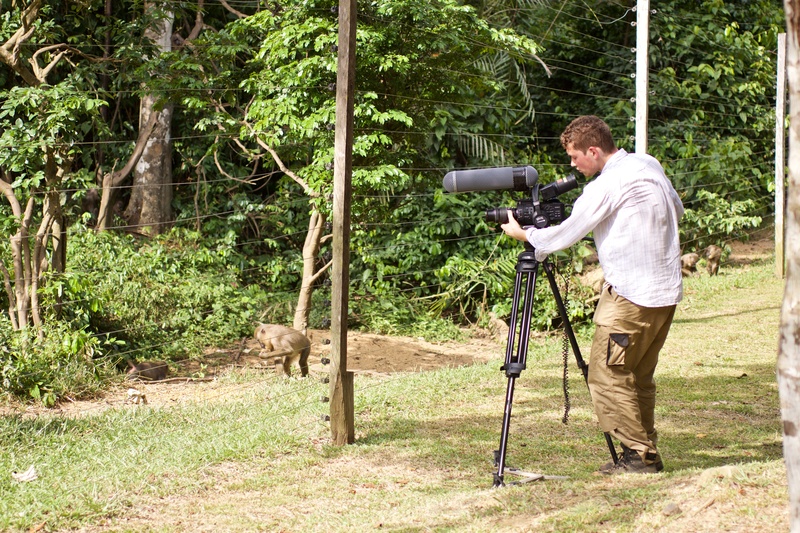 I then studied for a year at UWE in Bristol for a Masters in Wildlife Filmmaking, which took me back to Nigeria to make my film The Drills of Afi Mountain, and I’m now beginning a career as a wildlife filmmaker. Follow my journey into this exciting career on my blog, all views are my own.